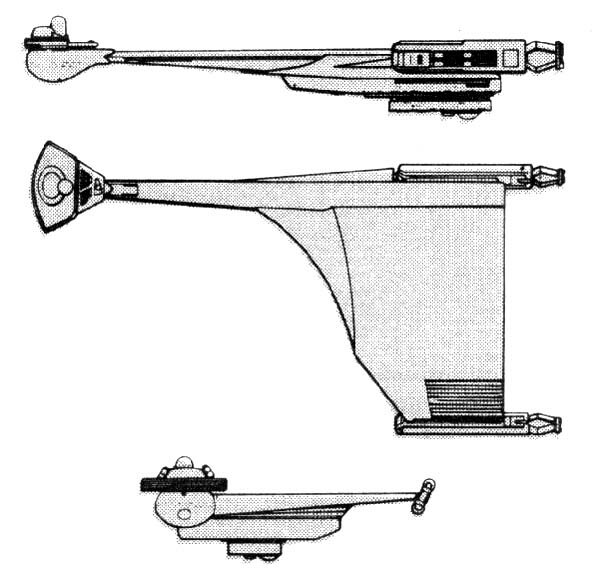 The D-11 destroyer was the most unusual design in the Klingon Imperial Navy, easily recognized on visual scan because of its one wing. It was commissioned into the service in 2262. That the vessel never fared well in battle has been blamed on its asymmetrical design, which worked to restrict the field of fire from the weapon mounting hard-points. Powered by the KWC-1 and able to travel at speeds of Warp 7, it was one of the fastest ships in known space at the time it was commissioned, as well as having satisfactory tactical maneuverability. Nevertheless, the first D-11s were unpopular with the crews, for they lacked sufficient firepower to perform their duties. It is not surprising then that a weaponry modification was made in the D-11C, in which the KD-4s were replaced with KD-5s and the new KD-10 was added. Although this extended the offensive range by 80,000 km, the D-11’s performance in battle was not significantly improved. The D-11D used the KWC-2 warp engine, increasing the warp speeds attainable. It also mounted a new photon torpedo, which gave it more destructive firepower in a limited range but did little to improve battle performance overall. Due to its problems and the success of other destroyer designs, the mission of the D-11 was changed in the late 2270’s. These vessels were reassigned to light assault duties. Having the capacity to carry a company of marines, the D-11s were used to secure lightly-held systems. They also had been reported to be accompanying the D-9 research cruisers in their efforts to open new territories. Despite having little faith in the design, attempts to improve the D-11 met with little success. The D-11E was so similar in combat capability to the D-11D that the shipyard foreman who green-lighted production was nearly executed when called before the High Council. Placing his entire house’s honor on the line, the foreman assured High Council Members and Appropriations leadership that an even better model could be produced. The D-11F was indeed an improvement over the D-11D, with an enlarged impulse drive and better shielding. However, it was the foreman’s wife who secured a deal for the necessary equipment to produce the D-11G, which saw a significant jump in capability and combat potential. Working with several design teams, a rework of the interior layout of the D-11 allowed for the doubling of the cargo bay. This also allowed a significant increase to the impulse drive, providing excellent power for combat operations. None the less, the D-11 was still outclassed by a number of newer designs. The D-11 was finally retired in 2311. Of the 354 D-11s built, 106 C’s and 41 D’s were converted to G’s; 68 Bs, 39 C’s, 18 D’s and 21 G’s have been destroyed; 1 D and 1 G have been captured by the Romulans; 11 B’s, 2 C’s and 1 G are listed as missing; 19 B’s, 4 C’s and 7 G’s have been scrapped; 6 B’s, 2 C’s, and 2 D’s have been sold to the Orions; 30 G’s were sold to the Naussicans; and 12 A’s and 30 G’s have been sold to private interests in the Triangle. The D-11 was manufactured at Taamar and H’renn. The class name of ‘One Wing’ and its nickname of “The One-Armed Bandit” derive obviously from its design, as well as from the Klingon dath d’lan. Many jokes circulate through Star Fleet concerning the design. The most long-lived of these has it that the designer was under pressure to have the design completed by a certain date. In order to satisfy his contract and spare his life, goes the story, the manufacturer completed the ship minus the starboard wing assembly. Power Units Available – 14 ea. 14 ea. 18 ea. 18 ea.